We recently broke bread and talked food with culinary and travel guru Sherry Page. We dined at Cindy’s Backstreet Kitchen, in the Napa Valley. And we both ordered the “Incredible Mushroom Tamales.” The dish lived up to its name. 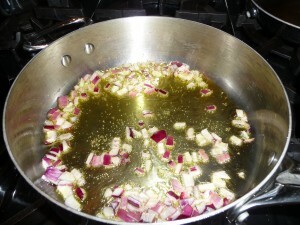 Below is a guest post and seasonal recipe from Sherry — the first of what we hope are more guest blogs from our friends. Sherry has taken cooking classes all over the world and operates a Bay Area firm called Culinary Getaways. She takes people on trips to food meccas such as Tuscany, Provence and the Napa Valley. She also writes a great food blog. Take it away Sherry! Spring is my favorite season. I can hardly wait each year for the spring vegetables and fruits to start appearing in our local farmers markets. Asparagus is among the first to make its debut and, luckily, it is one of my favorites! It is so delicious simply roasted or grilled, drizzled with my favorite extra virgin olive oil from California Olive Ranch, and sprinkled with a little flaky fleur-de-sel sea salt. Asparagus also works so well with pasta, in risottos, and in soups. Here is one of my favorite recipes that features delicious, nutritious, first-of-the-season asparagus. It makes two to three servings, depending on your appetite. Meanwhile, coat the bottom of the skillet with extra virgin olive oil and place it on the stove over medium heat. Add the onions or shallots and let them start to cook. Break the stems off the asparagus and discard (or use in stock, compost, etc.). Cut the asparagus into bite-sized pieces (about an inch in length). When the pasta is cooked but al dente (soft but still a little firm to the bite) in texture, remove it from the heat and pour into the colander to drain. 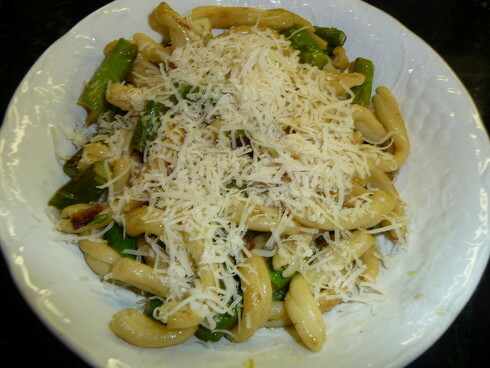 Pour the hot, drained pasta into the skillet with the asparagus and onions. Add the lemon juice and lemon zest. Stir gently to combine. Cook over medium heat for about 3 minutes. The pasta should start to brown on the bottom. Remove from the heat. Add sea salt and pepper, to taste. Plate the pasta in bowls. Top with grated cheese and a drizzle of extra virgin olive oil. (I used California Olive Ranch’s Limited Reserve for this.) Serve immediately.